Ah, the first day of kindergarten. So much promise and excitement leading up to this big milestone in the lives of your students. There is so much truth in saying that the goals for the first day are to “get them fed and get them home.” If you can do that, then I definitely call it a win. But you need to do a little bit more to fill your day. 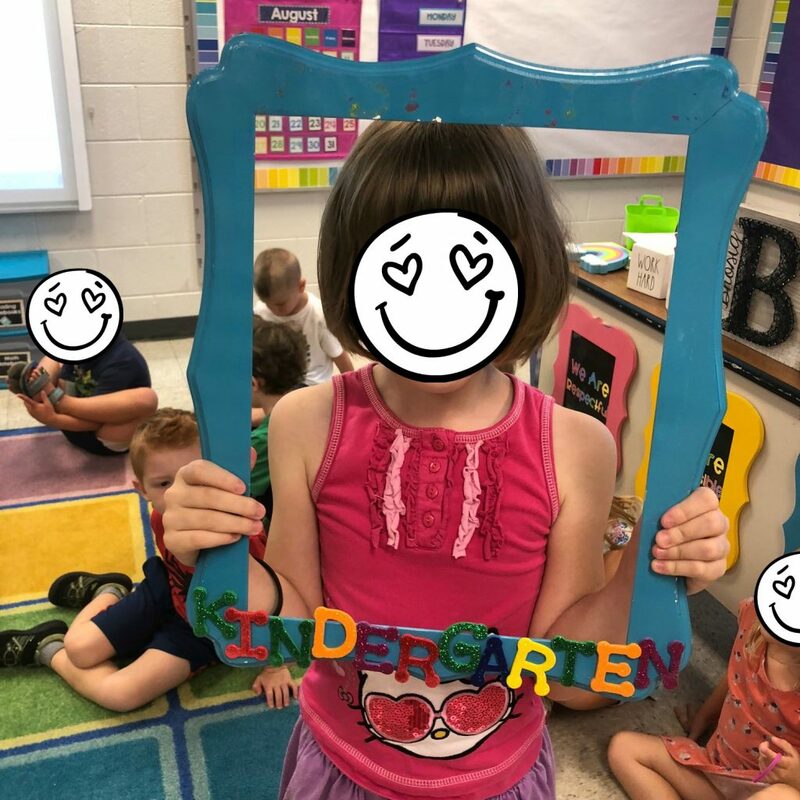 😉 Here is what the first day of kindergarten looks like in my classroom. When my students enter the classroom, I have something simple waiting for them at their seats. I’ve done playdough (mini cans) and coloring pages in the past, and both have worked out well. Playdough is nice because no one will scribble all over and say “I’m done!” after .5 seconds! While the students work quietly at their seats, I am calling them individually to show them where they will hang their backpack and how to make their lunch choice. As soon as possible, I gather my students on the rug. I show them the signal for the bathroom and we talk about how to flush the toilet and I show them the sink and trash can. I don’t fully go over the bathroom expectations right away, but I want to make sure that everyone knows how to get to the restroom when they need it. 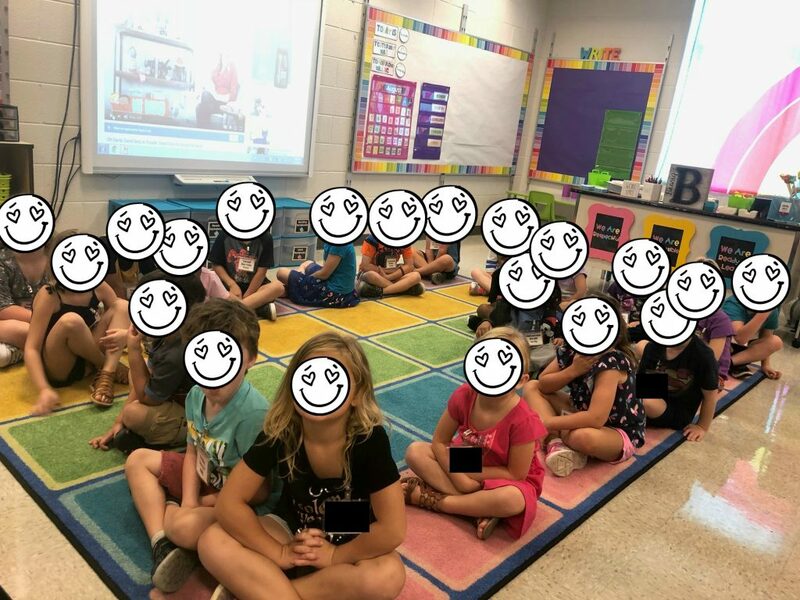 We then talk about how to sit on the rug so that everyone has personal space and can see the teacher. I talk about myself. 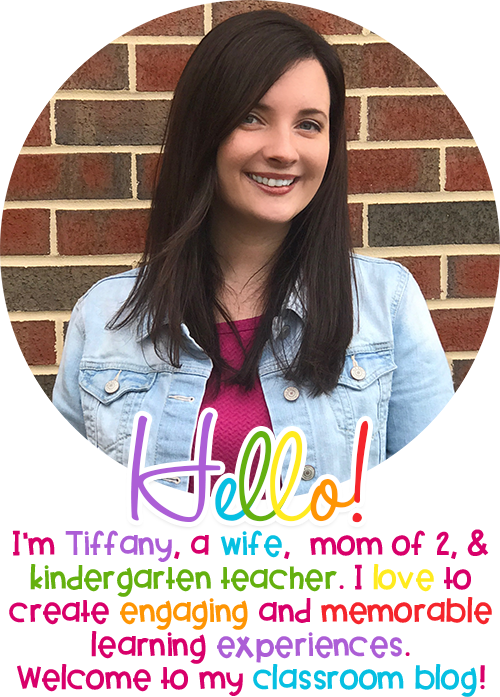 I tell the students that I have been waiting to meet them all summer long, and I am so excited to spend this school year with them! I tell them about my family and my hobbies. Then, I tell them that I want to get to know them better. We play a getting-to-know-you game. I keep it simple. I sing “I’m looking through my window,” and at each student’s turn, they tell one thing they like to do. 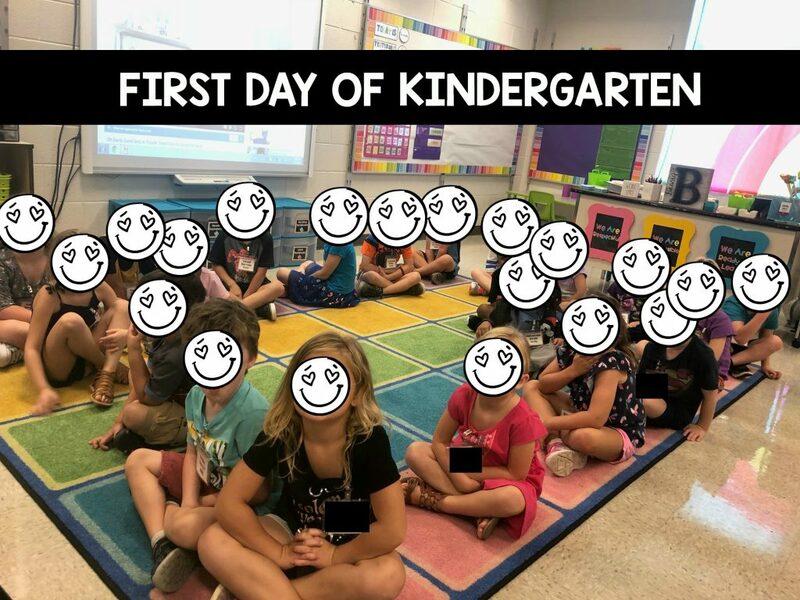 This is a great time to snap a “First Day of Kindergarten” photo! 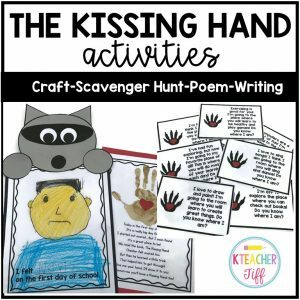 I usually read The Kissing Hand. I have a raccoon puppet and I invite students to talk to Chester and to tell him their feels and feelings. Then, we take a tour of the school using clues that Chester the raccoon left behind. I use my Kissing Hand Companion pack for this. Click on the cover to get it. Before we take our tour, we talk about the hallway procedures and practice walking in a straight line around the classroom. We then venture out and take a quick tour of the school. We stop in the cafeteria and practice going through the lunch line and finding our lunch table. When we get back to the classroom, we complete a “First Day of Kindergarten” coloring page. Talk about how to take care of crayons and put them away. I make the start of an anchor chart about classroom supplies (what they do/ They do NOT). 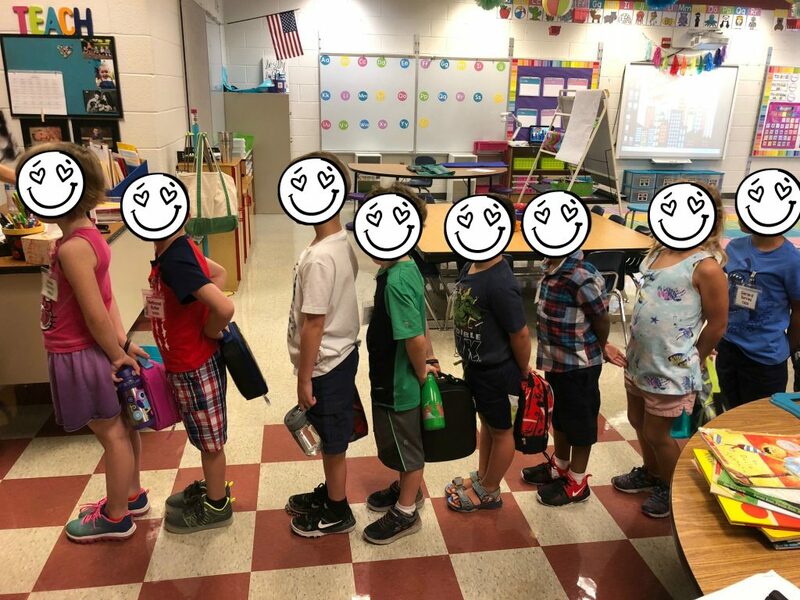 Model how students will walk to their seats and get started. Model how they will push in their chairs after they clean up. I like to have my students draw a self-portrait on the first day. I model how I draw myself and then invite them to draw themselves. I walk around as they draw and I encourage them to write their name on their paper if they know how, and I take note of who is already able to do this. 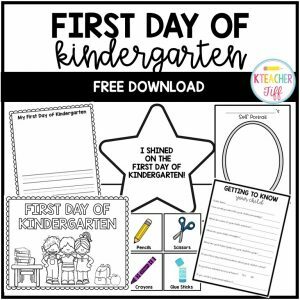 This First Day of Kindergarten Freebie includes a a parent questionnaire, writing page, self-portrait sheet, classroom tools anchor chart pieces, and an “I Shined on the First Day of Kindergarten” crown. 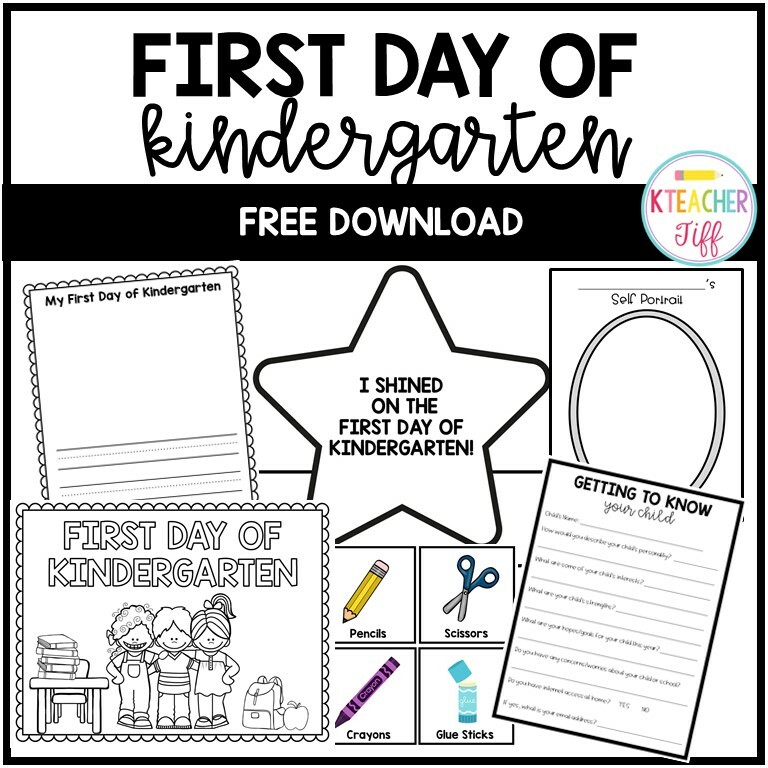 Sign up to get this First Day freebie! 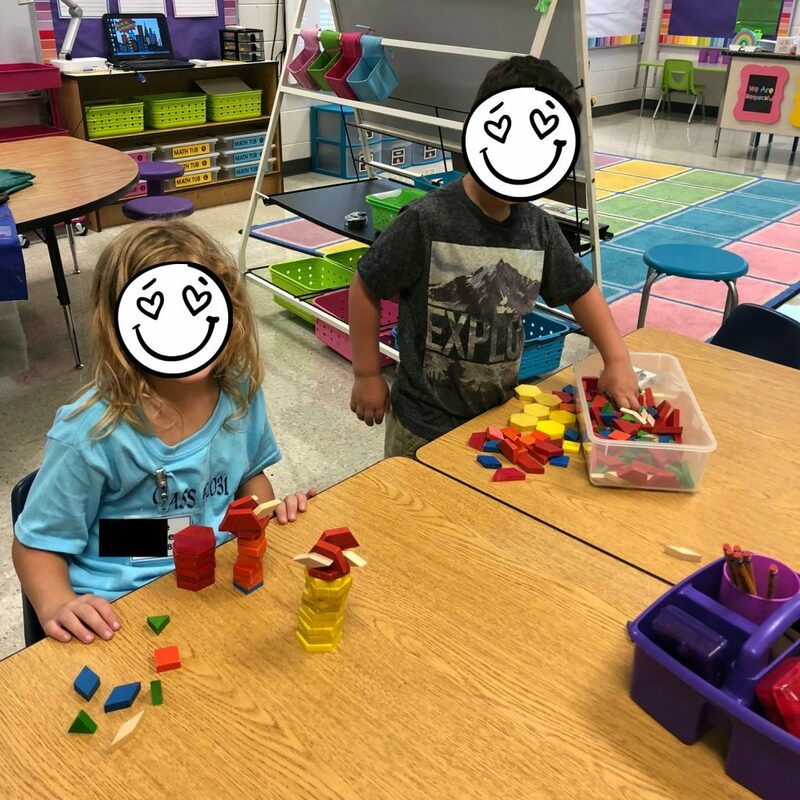 My math block is in the afternoon, so this is when I give my students free exploration time with manipulatives. I usually have pattern blocks, bear counters, and links. After a few minutes of exploration (or as soon as I sense it’s time if students are getting antsy, I rotate the tubs. I teach my students to stop, look, and listen when they hear the sound of my bell ringing. That’s how I get their attention when it is time to clean up. We also sing counting songs, and talk about more procedures such as how to clean up the materials. Recess is extra long on the first day, because we discuss the rules for each part of the playground while we are outside. All of kindergarten usually does this at the same, and my teammates and I demonstrate proper playground use. We also act out examples of what NOT to do. Throughout the day, I mix in lots of singing and dancing. I teach some of the call backs that I use (class! yes? 1-2-3 eyes on me, etc.) Sometimes, even a game of “Simon Says” is the perfect way to get out wiggles. I make sure to begin this process early. My students practice getting their folders from their mailboxes and putting their papers inside. They then put their folders inside their backpacks and return to their seats. I read a story at the end of the day. 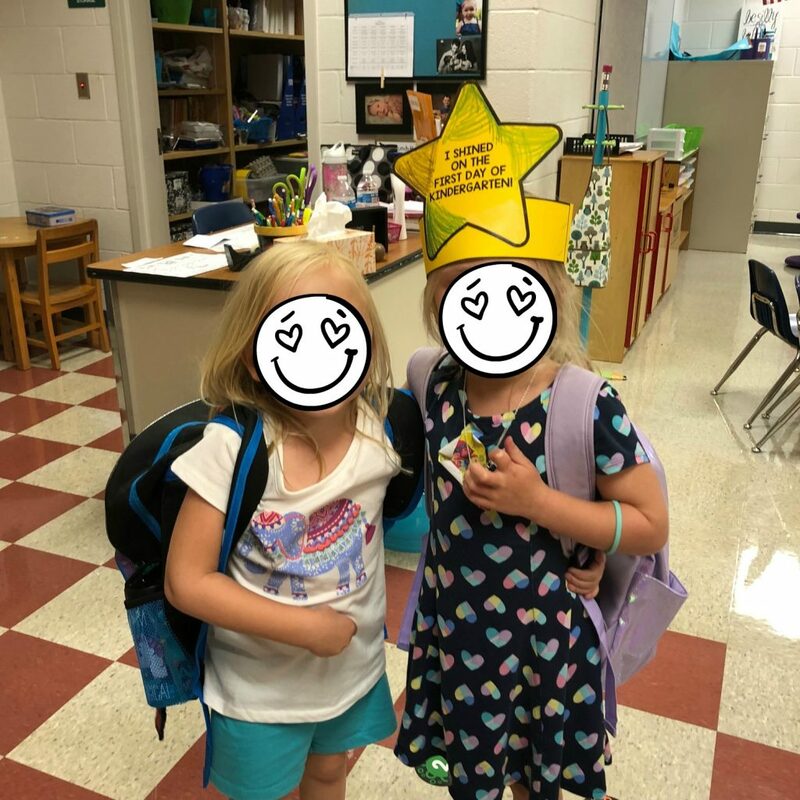 If you keep it simple, focus on procedures, get them fed and sent home, the first day of kindergarten will be a success!